Surgical Robots Market Increasing automation in the healthcare industry and proliferating demand for minimally invasive surgeries has led to the growth of the surgical robots’ market on a global scale. 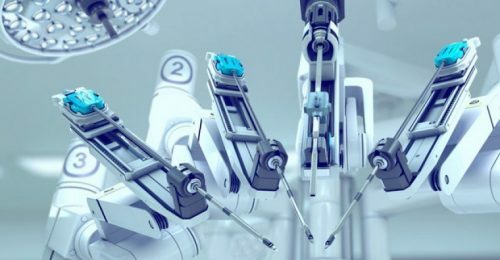 Robotic surgery, also known as robot-assisted surgery, enables doctors to perform a wide variety of complex procedures with much more flexibility, accuracy, and control than conventional surgical techniques. This modern form of surgery involves the use of surgical robots to improve the performance level and increase the rate of success. These forms of surgeries are normally associated with minimally invasive surgery, which involves procedures that are performed through extremely tiny incisions. However, risks associated with robotic surgeries, high pricing of the surgical robots, and negative attitude towards technology can strikingly hamper the market growth. MRFR states that the global surgical robot market is expected to garner an impressive growth of rate of 22.75% over the forecast period of 2017-2023. The global surgical robots market comprises of various noteworthy players who are constantly coming up with new and innovative solutions to further advance the device and enhance its efficiency level. Some of the key players in the market are Medtronic, Google Life Sciences, Stryker Corporation, Mazor Robotics, Intuitive Surgical, Inc., TransEnterix, Johnson & Johnson, Hansen Medical and others. 13th Feb 2019, Johnson & Johnson, a global healthcare giant, revealed its plan of acquiring Auris Health, a surgical robotics company, for a striking $3.4 billion in cash. The global giant looks to further expand its digital surgery business with this move. Vicarious Surgical announced that it had closed a $10 million round of funding led by Bill Gates’ Gates Frontier. The company will use this money to continue to develop its technology combining surgical robots and VR. 14th Feb 2019, it was announced by Vicarious Surgical that it had closed down a $10 million round of funding that was led by billionaire Bill Gates’ Gates Frontier. The company mentioned its plans of continuing to develop its technology of combining surgical robots and VR with the money. The segmentation of the global surgical robot market is divided on the basis of control mechanism, application, and surgical robot. By control mechanism, the market includes computer control and direct telemanipulator. By surgical robot, the market involves telesurgery systems, robotic radiosurgery systems, shared control robotic surgical systems, and supervisor-controlled surgical system. By application, the market segments into gynecologic surgery, urologic surgery, general surgery, cardiac surgery, colorectal surgery, head and neck surgery, and others.